Clayton Lowery, owner of Louisiana safety training facility FRC, recently contributed to the C.E. "Charley" Lowery Memorial Scholarship at Stephen F. Austin State University. His grandfather, O.L. Lowery, endowed the scholarship in 1983 in honor of his great-grandfather, C.E. Lowery, who began working at SFA in 1924 as the university's first security guard. Pictured, from left, are Heather Howell, former scholarship recipient; William Hartley, a sergeant with SFA's University Police Department; Amanda Kennedy, assistant chief of UPD; and Clayton Lowery. NACOGDOCHES, Texas - Clayton W. Lowery recently contributed to the C.E. "Charley" Lowery Memorial Scholarship on behalf of his father, John L. Lowery, and his grandfather, O.L. Lowery. His grandfather created the scholarship with the Stephen F. Austin State University Alumni Association in October 1983 honoring his great-grandfather, the late C.E. Lowery of Nacogdoches. Clayton's grandfather, O.L., was born in Smyrna and received a teaching certificate from SFA in 1925. O.L. 's father, C.E., began working for SFA in 1924 - just one year after the university opened - as the first campus security officer. O.L. 's motive for creating the scholarship was simple: his father "was one of the hardest working men you ever saw," he told newspaper reporter Jill Darling in 1983, and he wanted to honor his memory. The C.E. 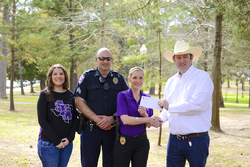 "Charley" Lowery Memorial Scholarship is awarded every spring to an employee of SFA's University Police Department. It has assisted dozens of students in paying for additional expenses incurred when seeking a college education, including books and other supplies not covered by regular financial assistance. As Clayton explained, the scholarship's benefits were a two-way street, both assisting SFA students while also bringing his grandfather, O.L., everyday joy. "My grandfather was last at a retirement home here in Nacogdoches and one of the things he enjoyed the most were the annual visits from the scholarship recipients," Clayton said. "He had pictures of every student on his wall, so it was very rewarding for him to give the gift and visit with the recipients." Clayton is the owner of FRC, recognized nationally by the National Shooting Sports Foundation as a five-star indoor safety training facility and range in Louisiana. FRC now trains security officers, which creates a perfect connection to the C.E. Lowery scholarship. FRC and the Lowery family will continue to support the scholarship and stewardship of future recipients.